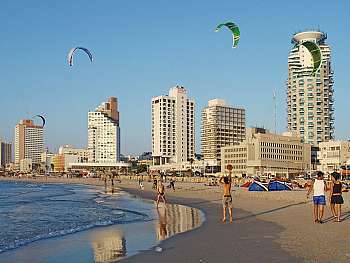 Upon arrival you will meet our representative and be transferred to your hotel in Tel Aviv. 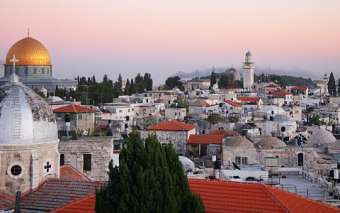 We drive for a short visit of the city of Jaffa (Joppa) where we will take a short walking tour in picturesque alleys of the old, fortified town. We will pass by the house of Simon the Tanner and marvel at the views from the hill top. We drive north along the coast to the archaeological ruins of Caesarea, built by Herod the Great in honor of Augustus Caesar. From there we go on to visit Megiddo where the book of Revelations mentions a great battle at the place called "Armageddon". It is an ancient city inhabited continuously for more than five millennia (6000-500 B.C.). After exploring the ancient ruins we drive toward the Sea of Galilee. 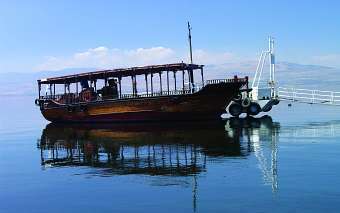 Arrive at Tiberias and check-in to your hotel. 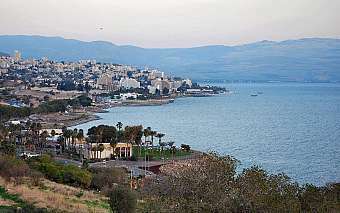 Start the day from historic Tiberias, where Jesus lived, sojourned, and preached on the shores of the Sea of Galilee. Our next destination will be Capernaum, the center of Jesus ministry. On to Tabgha, just north of Tiberias, the site of Christ’s miracle of feeding the 5,000 and at the Church of Multiplication, where the mosaic floor depicts a basket with loaves and two fishes. We drive on to the Mount of Beatitudes overlooking the Sea, where Jesus preached the “Sermon on the Mount” and it is believed that Jesus picked his 12 apostles. 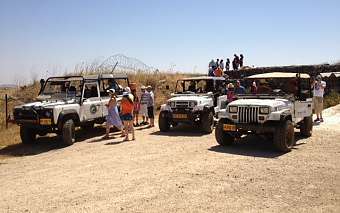 We ascend to the Golan Heights to view the panoramic view of the peaks of Mt. Hermon, the rugged plateau of the Golan Heights, and beneath it the green pastoral Hula Valley. Visit the Yardenit Baptismal Site, located along the Jordan River, south of the Sea of Galilee. Return to Tiberias for another night in town. This morning we travel to Cana to visit the Wedding Church where Jesus performed his first miracle, turning water into wine. 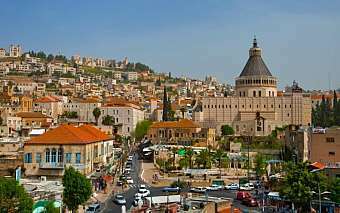 We proceed to Nazareth, where Jesus spent his childhood, and the Church of Annunciation, built on the site where archaeologists believe the Archangel Gabriel appeared to the Virgin Mary. You will also see Mary’s Well and Joseph’s Church. Drive through the Jordan Valley to Beit Shean with its recently excavated amphitheater. Visit the excavations of this beautiful preserved Roman City which was destroyed in an earthquake. Continue to Jerusalem, to check-in at your hotel. Through remarkable scenery of the Dead Sea we continue to Masada which is situated on an isolated cliff in the Judean Desert. The site was declared as a UNESCO World Heritage Site in 2001. Ascend by cable car to the fortress, which was the last stronghold of the Jewish Zealots in their war against the Romans. Visit the excavations, King Herod’s palace, the synagogue, bathhouse and much more. Enjoy the breathtaking view of the Roman camps and the Dead Sea. En route to the Dead Sea, you will visit the site of the Qumran Caves where the Dead Sea Scrolls were discovered. Nearly 1,300 feet below sea level, the Dead Sea is the lowest point on the earth’s surface. Bring your swimsuit as if weather permits it’s possible to “float” on the salty, mineral rich, water. Return to Jerusalem for an overnight. Start the day at the Israel Museum’s Shrine of the Book with the famous Dead Sea scrolls, then a visit to the beautifully renovated model of the Herodian city of Jerusalem, dating back to the time of the Second Temple. Enjoy Ein Karem; a picturesque village in the south western outskirts of Jerusalem. 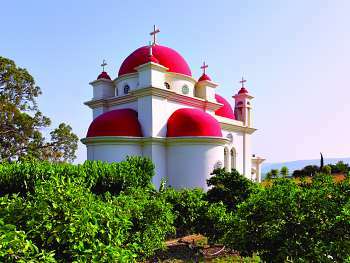 This small village has great significance in Christian traditions, since this is where according to tradition John the Baptist was born. Visit Yad Vashem the official memorial to the Jewish victims of the Holocaust, established in 1953, located at the foot of Mt. Hertzl. 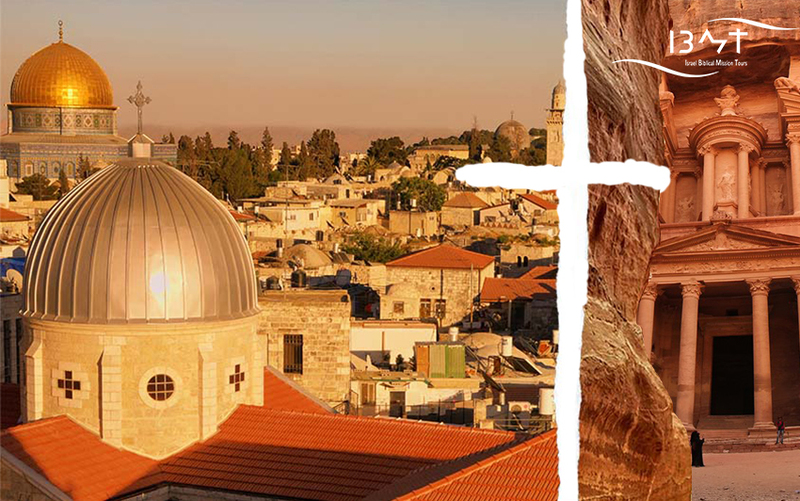 Visit Bethlehem** - the birthplace of Jesus at the Church of the Nativity and Manger Square. Return to your Jerusalem hotel. Enter the Old City of Jerusalem where you will see the Western Wall and the actual site of the Second Temple, the Temple Mount. Walk the Way of the Cross, the Via Dolorosa, to Calvary and the Church of the Holy Sepulchre, housing both the traditional site of Crucifixion and the Tomb of the Resurrection. To the southwest, just outside the Old City, is Mount Zion, with the traditional tomb of King David and the Room of the Last Supper. 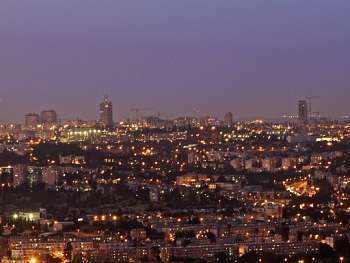 Enjoy the spectacular panoramic view of Jerusalem - the holy city for each of the world’s three great religions – Christianity, Judaism and Islam, from atop the Mount of Olives. Visit the Garden of Gethsemane where Judas betrayed Jesus. Drive from Tel Aviv and Jerusalem to the Sheikh Hussein border crossing for procedures to enter Jordan. 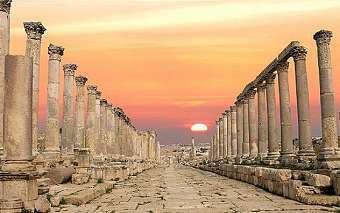 Proceed to Jerash - city of the Decapolis, located about 45km north of Amman in the fertile heights of the Gilad. Visit the ancient Roman city with colonnaded streets, the baths and the hill of the top Temple etc. 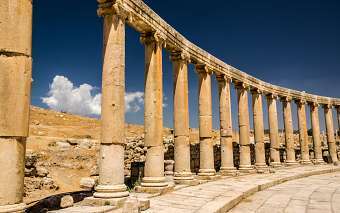 Drive to Amman for a panoramic city tour of the Jordanian capital. 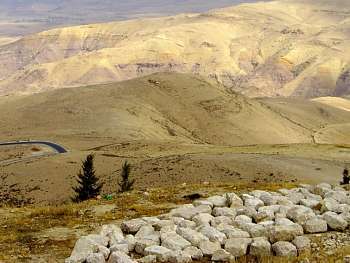 Drive to Mount Nebo, from where Moses viewed the Promised Land. From there you will see the Jordan Valley, Jericho and the Dead Sea. Continue along the Desert Highway to Wadi Musa, the modern village of Petra. Enter the site of Petra and walk, or ride on horseback to the "Siq" (Canyon). Walk through the "Siq" to the red rock city, the ancient capital of the Nabateans from 3rd Century BC to 2nd Century AD. 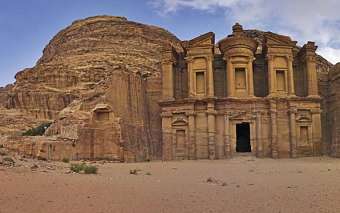 Visit the most interesting carved monuments such as the Treasury (El Khazneh - a tomb of a Nabatean king) then the field of tombs, obelisks, the altar etc. From this point you can view the whole of the rock city. After the visit, return to Wadi Musa. After breakfast drive south to the towering mountains and rock formations of Wadi Rum, which mesmerized Lawrence of Arabia. Drive through the stunning desert landscapes on a jeep safari, visiting the Lawrence Spring and Khazali Canyon. Drive north to Madaba to visit the remains of the Byzantine church with its ancient mosaic floor map, the oldest surviving original cartographic depiction of the mosaic map of the Holy Land and Jerusalem. After breakfast, leave the hotel and drive to the border. Cross the Jordan River and drive back to Tel Aviv. 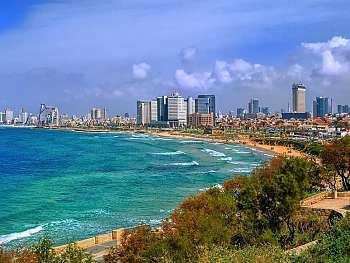 Departure transfer from Tel Aviv to Ben Gurion Airport.